Web Marketing Association is looking for experienced Internet professionals who can help judge the Websites entered into its 23rd annual international WebAward competition. Judges consist of a select group of Internet professionals who have direct experience designing and managing Web sites, including members of the media, interactive creative directors, site designers, content providers and webmasters. Boston, MA, March 19, 2019 --(PR.com)-- Excellence deserves recognition and the Web Marketing Association is looking for experienced Internet professionals who can help judge the Websites that are entered into its 23rd annual international WebAward competition, the standards-defining award program that sets industry benchmarks based on the seven criteria of a successful Web site. Interested individuals can submit their names for consideration using the WebAward Judges Nomination Form. Judges will consist of a select group of Internet professionals who have direct experience designing and managing Web sites, including members of the media, interactive creative directors, site designers, content providers and webmasters – with an in-depth understanding of the current state-of-the-art in Web site development and technology. Past judges have included top executives from leading organizations such as Universal McCann, SapientNitro, T Rowe Price, Bridge Worldwide, Disney, Euro RSCG, Boeing, Huge, ING Direct, VML, Facebook, J. Walter Thompson, Gartner, Possible Worldwide, YUM!, Cuker Interactive, PayPal, Razorfish, Munich Re, Refinery, Ernst & Young, Magellan Health Service, Microsoft, R/GA, Family Cookbook Project, Saatchi & Saatchi, SAP, and Starwood Hotels. 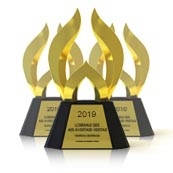 The 23rd annual international WebAwards competition sets the standard of excellence in 96 industry categories by evaluating Web sites and defining benchmarks based on the seven essential criteria of successful Web site development. The goal of the Web Marketing Association, sponsor of the WebAwards, is to provide a forum to recognize the people and organizations responsible for developing some of the most effective Web sites on the Internet today. Entrants benefit from a Web site assessment by a professional judging panel and the marketing opportunities presented to an award-winning Web site. For more information or to enter a site into the 2019 WebAwards, visit www.WebAward.org.